A nostalgic, hopeful urban holiday song that recalls the little things that make Christmas memorable. Guitar, mandolin, button accordion, National slide guitar, mellotron and warm vocals combine to create a richly textured, uptempo and unique sound. 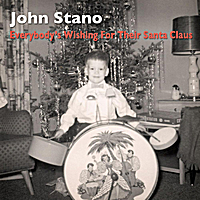 John Stano: Guitar, vocals, background vocals, mandolin, National Resonator lap-slide guitar and button accordion. Mike Hoffmann: sleigh bells and mellotron.